^ 1.0 1.1 MacKenzie, Carina Adly. CW announces 2012 season premiere dates: Why do 'The Vampire Diaries,' 'Supernatural' and more start late?. Zap2it（英语：Zap2it）. June 28, 2012 [June 28, 2012]. （原始内容存档于2012年6月29日）. ^ Kondolojy, Amanda. 'Arrow' Officially Picked Up for Full Season. TV by the Numbers. October 22, 2012 [October 22, 2012]. （原始内容存档于2012年10月24日）. 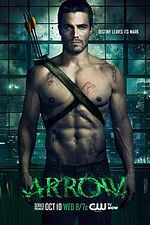 ^ 绿箭侠 Arrow大爆料 第一季后续剧透：Oliver的真实身份将暴露，Oliver的母亲可能不是大反派、Oliver降脚踩N条船？ 互联网档案馆的存檔，存档日期2014-10-21. ^ Lesley Goldberg , Lacey Rose. CW's 'Carrie Diaries,' 'Arrow,' 'Cult,' 'First Cut,' 'Beauty and the Beast' Ordered to Series. The Hollywood Reporter. May 11, 2012 [May 12, 2012]. ^ Gorman, Bill. CW 2012-13 Primetime Schedule: 'Supernatural' To Wednesday, 'Nikita' To 9pm, 'Beauty & the Beast' Follows 'Vampire Diaries' & Lots More Changes. TV By the Numbers. May 17, 2012 [August 18, 2012].